Want to get title capitalization right and don’t know the rules? Online tools promise correct caps every time. Find out here if they are any good (and rule-following), and which title capitalization tool is the best for which job. in Theo van Doesburg’s hands. When the 20th century was but some two decades old, a group of Dutch artists, architects and designers (called “de Stijl”) celebrated abstraction and reduction: everything was to be made of—ideally black and white—rectangles arranged in right angles if possible. Theo van Doesburg turned this idea into an influential typeface. It is made up of 25 squares arranged in a 5×5 grid, and the squares were colored to make up the letters… the uppercase letters. If you delight in adverbial use of conjunctions, you will rejoice to know that Title Case Converter takes great care to identify these and other special cases from context when capitalizing in titles; if you care not to know what “adjectival” could mean, it is your choice to ignore all explanations—and just copy a correctly capitalized title from Title Case Converter with confidence and convenience. 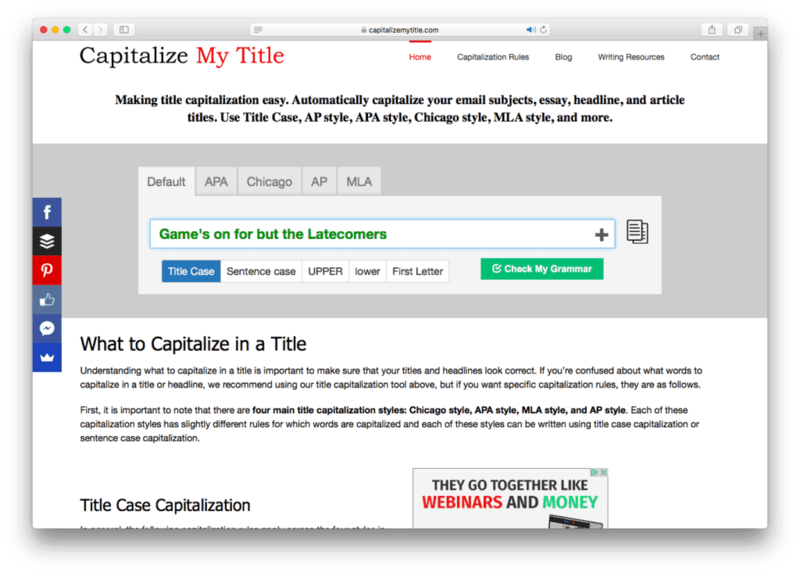 Title Case Converter is usually right about what letters to make uppercase in titles, and in more than one way: it knows about the AP (Associated Press), Chicago Manual of Style, Modern Language Association, and Wikipedia rules to capitalize in headlines. For an overview, it will show your headline in all supported styles side by side and highlight the differences—from each other and from your input. Unfortunately, there is no way to make up your own set of rules. 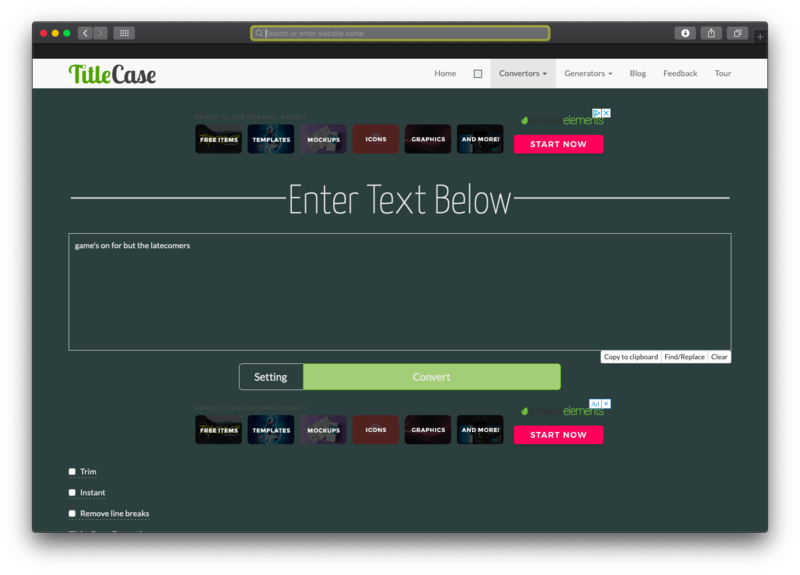 Title Case Convert does remember choices and settings between uses, though, so you will get your favorite style (or styles) by default, for instance, and whether you care for highlights and wordy explanations. 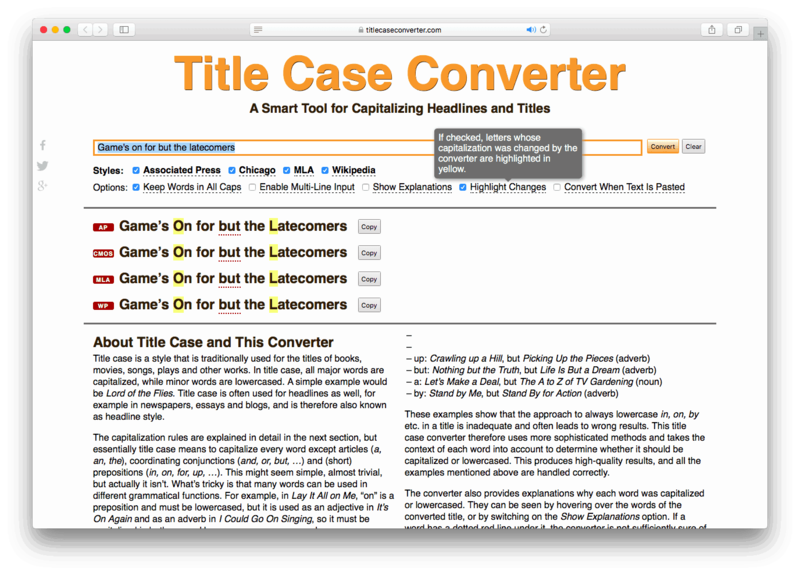 With Title Case Converter, rigor does not translate to impracticality: you can have it convert text as soon as you paste it, and you get buttons to copy capitalized headlines with a click. Title Case Converter cannot, however, convert text in place, and it offers no other tools for transforming text (such as turning it into sentence case). You came, you pasted, and you copied. That, for the most part, is capitalizing titles in Capitalize My Title, and it works with typing (instead of pasting), too. So, for quick and standard cases, Capitalize My Title is a swiftly efficient tool. 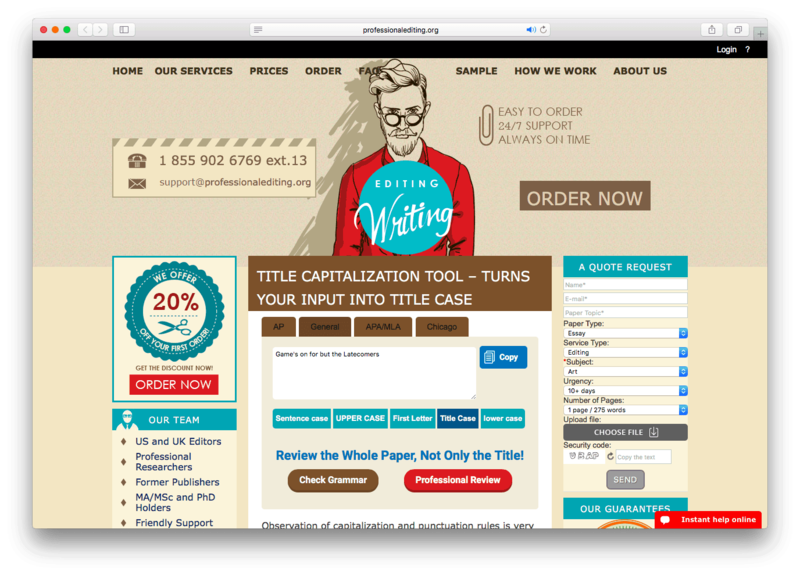 Speaking of customization, Capitalize My Title does not allow you to create your own capitalization rules and style. 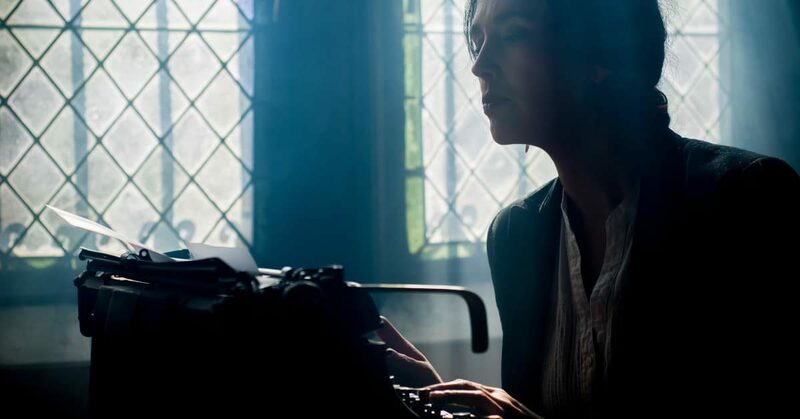 What it can do, though, is transform text in ways that are useful beyond the headline: you can easily make your words all lower or upper case, for instance, or convert them to sentence case. While Capitalize My Title does lay out the rules it follows for applying the various title capitalization styles, you cannot ask it to explain what it does—or just highlight how it changed your attempt at getting capitalization right. Unfortunately, its following the rules is less than perfect as well: Capitalize My Title fails to capitalize the adverbial or adjectival use of conjunctions, for example. It looks attractive and calls itself “professional.” What more could you expect? The Professional Editing Title Capitalization Tool conveniently changes text right in place as you paste or type and choose between your options. These are numerous and include the usual style guide suspects as well as changing all to lower or upper case, for instance. 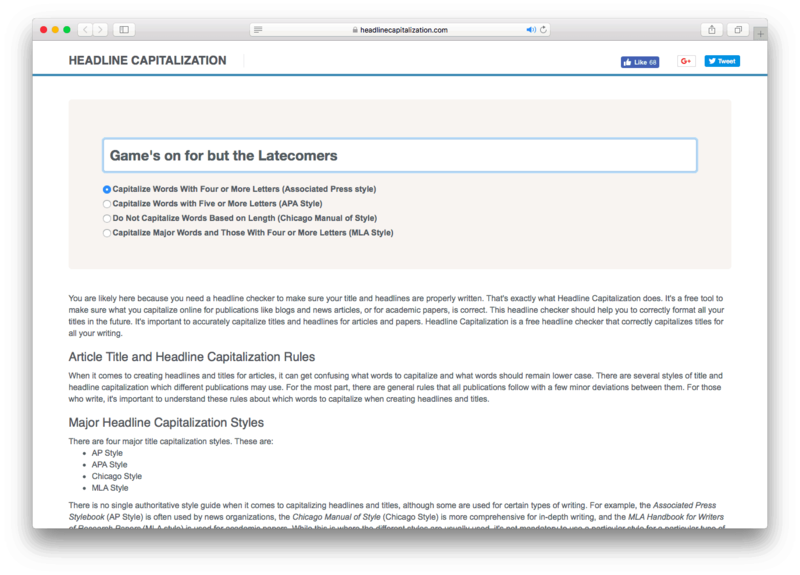 Unfortunately, the Title Capitalization Tool is a bit simplistic about applying the rules of capitalization and makes mistakes. It is a good thing, then, that professional editing help is near from Professional Editing’s editors. For casual use and quick conversions of headlines that are not critical, Professional Editing’s Title Capitalization Tool is still a good-looking alternative. Includes tools for sentence case, upper case, etc. Simplicity is a virtue. Headline Capitalization is virtuous. You need not change tabs or wade through explanations; you need not navigate long fields for entering text or ignore choices for text transformation outside headlines; you need not press buttons or make up your own ruleset even. All you need to do is paste (or type) your headline and let Headline Capitalization make sure it conforms to one of the four common capitalization styles. Unfortunately, Headline Capitalization is simple (rather than virtuous) in its checking the rules as well. It checks for word length and type only, not for usage. So, things like adverbial use escape Headline Capitalization, and it might miscorrect you. If force seemingly brute will get you there, why not let it? This results in often correct but not necessarily spotless headline capitalization when you enter your text into TitleCase. You can adapt the list of exceptions for your needs and add words that should not be capitalized or ignored altogether, but that somewhat defeats the purpose of a tool doing just this for you. That aside, TitleCase puts other, similar tools within very easy reach: you can quickly convert your headline to camel case, for instance, or have words joined by hyphens and dots in hyphen and dot case respectively. Conversions not easily done elsewhere within easy reach: camel case, dot case, snake case, etc.